With Fall quickly approaching, I am taking advantage of the last little bit of summer and wearing lots of bright colors today! I love pairing unexpected colors and this beautiful Derng necklace makes it even more fun!! I really love all of the fun colors in this necklace and it really pulls this whole outfit together! I also wore it with a black top and it was the perfect pop of color! I just got it on Friday and I have already worn it twice!! Scroll down to enter the Derng $50 gift card giveaway! Top: J.Crew also love this one, Jeans: J.Brand, Belt: J.Crew (old) similar here Shoes: ASOS, Clutch: J.Crew (old) love this one, Necklace, c/o Derng, Bracelets: c/o SiraMara, c/o gigglosophy, c/o poshlocket, Sunnies: Karen Walker, Lips: MAC Candy Yum Yum Today I have teamed up with one of my FAVE jewelry companies, Derng! They have so graciously offered to give away a $50 gift card to ONE lucky SOS reader! You are gonna want to enter this one because Derng has the most amazing jewelry at really great prices!!! To enter you must complete all the steps in the Rafflecopter widget below. GOOD LUCK!! Last few hours to enter to win a $250 visa gift card here! Absolutely gorgeous necklace!!! Great giveaway! Love how you paired it with the purple top! Love the simplicity of that top! I am obsessed with this outfit!!!! 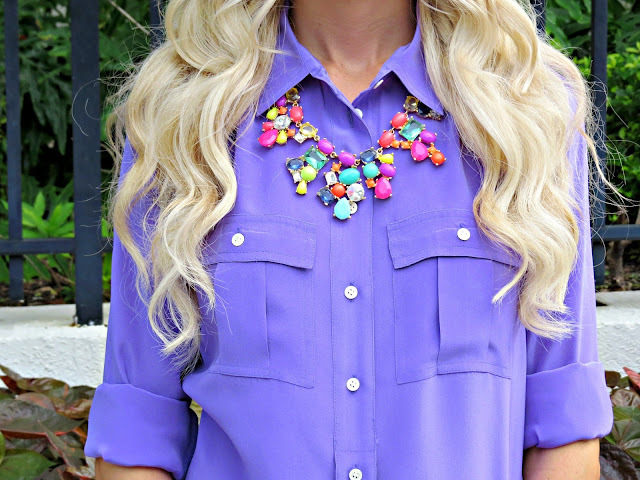 That necklace looks awesome paired with purple! I love all of the colors here Jade... so fun! I love this outfit, Jade. Love the colors together, and I quite agree that the necklace pulls all the color together!! I LOVE this!! The colors are so fun together. You look gorgeous! I love the purple and yellow color combo! So fresh! Great colors, but those yellow shoes are so great!